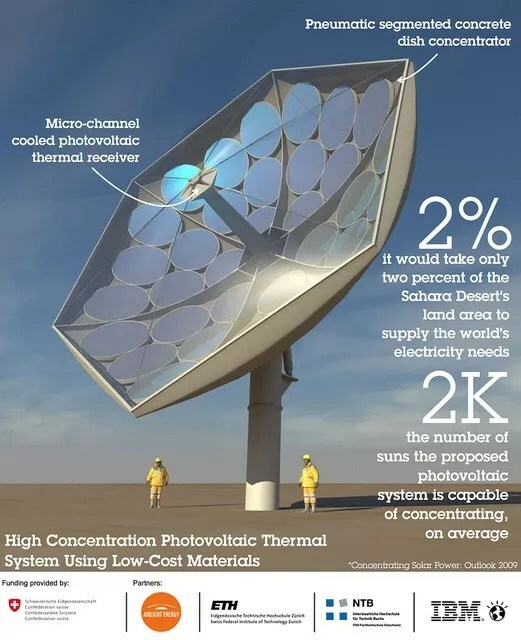 A cost-competitive photovoltaic system that can concentrate sunlight 2000 times and capture 80% of the concentrated energy, and deliver clean water and air-con. How does a cost-competitive photovoltaic system that is able to concentrate sunlight 2000 times and then capture 80% of the concentrated energy sound? Such a system is currently being developed by researchers at IBM Research, Airlight Energy, ETH Zurich, and Interstate University of Applied Sciences Buchs NTB, after winning a three-year $2.4 million grant from the Swiss Commission for Technology and Innovation. The prototype system makes use of a large parabolic dish, composed of a number of mirror facets, which are coordinated to a sun tracking system. The system automatically repositions itself to the optimum angle for power generation. The sunlight that hits the mirrors is reflected off of them onto a number of microchannel-liquid cooled receivers with triple junction photovoltaic chips. Every one of these 1×1 centimeter chips “can convert 200-250 watts, on average, over a typical eight hour day in a sunny region.” And there are hundreds of these chips in the design, providing a total of about 25 kilowatts of electrical power. This article was originally published at Solar Love. Reproduced with permission. 1m solar rooftops - where will the next million come from? So when do they expect them to be commercially available? I want one on my farm!! Panels, Gus. You can get them today and have them working within a week. According to them, “the levelized cost of energy will be less than 10 cents per kilowatt hour (KWh). That is not good enough. PV solar is already under 10 cents per kWh and heading lower. If they want to compete with PV they better hit 5 cents.